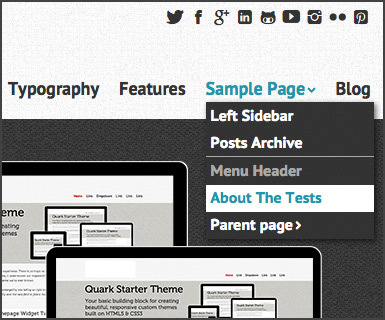 Quark is your basic building block for creating beautiful, responsive WordPress themes. It's not a convoluted or confusing framework. 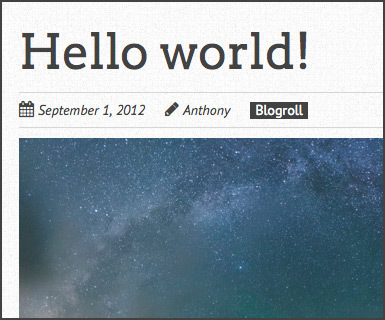 It's a simple and elegant WordPress starter theme built on HTML5 & CSS3. It's based on the Underscores (_s) and TwentyTwelve themes, so that means not only is it flexible, it's extremely easy to customise. The code is clean and tidy and sprinkled with just the right amount of comments to help make editing a real breeze. There's no need to make a child theme (unless you really want to), just dig in to the code & use it to give yourself a kickstart in creating your next awesome theme. Its base is a responsive, 12 column grid. It uses Normalize to make sure that browsers render all elements more consistently and Modernizr for detecting HTML5 and CSS3 browser capabilities. It uses box-sizing:border-box for a more natural box layout model along with some default stylings from HTML5 Boilerplate. There's also some default custom media query breakpoints built in (as opposed to device specific breakpoints), so it looks pretty sweet on smaller devices. Of course, you'll probably want to change these if you change the design, just to make sure things fall in place properly. Quark incorporates custom theme options with the inclusion of the Options Framework, so they're super easy to modify. 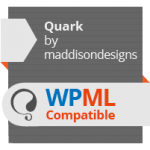 Quark is WooCommerce compatible, Multilingual Ready (WPML) and translated into Spanish, German and French. The gorgeous built-in, retina friendly icons are real easy to style with css. Check out a sample of the typography and icons. Making use of standard WordPress features such as dropdown menus means there's no learning curve when implementing a theme. Check out all the features. You'll see all the standard Post Formats are supported as well a variety of custom Templates. Its base is a responsive, 12 column grid. Using percentages for column widths makes for a flexible grid system. Its sensible class naming, makes it super easy to adapt to any configuration you require. It uses Normalize to make sure that browsers render all elements more consistently and Mordernizr for detecting HTML5 and CSS3 browser capabilities along with some default stylings from HTML5 Boilerplate. The inclusion of the Options Framework by Devin Price makes it super easy to add custom Theme Options to your theme. Get the power and flexibility of WordPress with features such as Custom Headers and Custom Backgrounds. All the standard WordPress Post Formats are supported along with a variety of common theme templates. There are lots of great starter themes and frameworks out there now. Some better than others. I created this one when I couldn't find the perfect match that I was looking for. You should check it out, because, well, it's pretty cool! I love the default themes that WordPress gets bundled with now. TwentyTwelve and TwentyThirteen are both great starting points for creating new themes. They're clean and fairly minimal, which is what I like. They're developed by the same guys who code WordPress so you just know that when you look through the code, it's gonna be some quality work. I used TwentyTwelve and Underscores (_s), another theme by the talented Automattic folk, as a starting point for creating Quark. After upgrading the base html with a 12 column grid, I then added my own features that I constantly use when creating themes for my own clients. It has a minimal amount of styling so that it's not too difficult to make into your own. There's no unnecessary bloat from including things like sliders, forms and shortcodes. These are best served by using dedicated plugins that match up with your own requirements. I find there's nothing more annoying than using some framework or theme with all these extra features that you don't need or never use. You can download it from the WordPress Theme Directory or if you’re still not convinced, go check out the demo and see for yourself. If you're using Quark and interested in helping translate it into your own language, that would be awesome! Simply head over to the GlotPress site on WordPress.org, select your language, and dive in! If you're new to translating WordPress, you can have a read through the Translator Handbook to get started.